Index > Technology News > How you can do a right format work for the HDDs in an internal storage RAID product? Format work is to set up the Partition in the HDD. This work will delete and clear out all existing data files and the old RAID setting in the HDDs. Please be always very carefully to do this format work. Please follow the instruction from User Manual and install a Raidon internal storage RAID enclosure into your PC (including the right connection of the signal & power cables), you are ready to start using it now. 1.Disk Management Utility shows your new installed all the HDD information in your Raidon product. 2.Right before you start using your Raidon product, you should first select the format type to complete the whole installation work. It’s easier for you to format a Raidon product in Win OS than any other OS systems. 2.Press move your curser to “Computer”, click right button (mouse), move curser and click at “Manage” which is in the new popped out small screen. 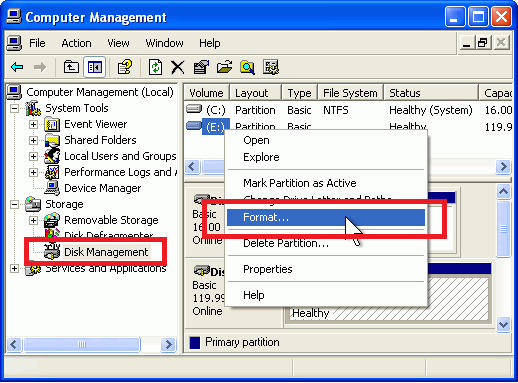 3.Please move curser to “Storage”, then “Disk Management”, and click it. 4.Move your curser to the storage area, click right button, and then click the format. Warning: User needs the Authorization to access this format work at the Win Vista and all its later Windows versions. Since you will normally use mkfs instruction to do the format work, and mkfs instruction always needs parameters for installation.And Unix/Linux would also request an Authorization to you for doing the format work.